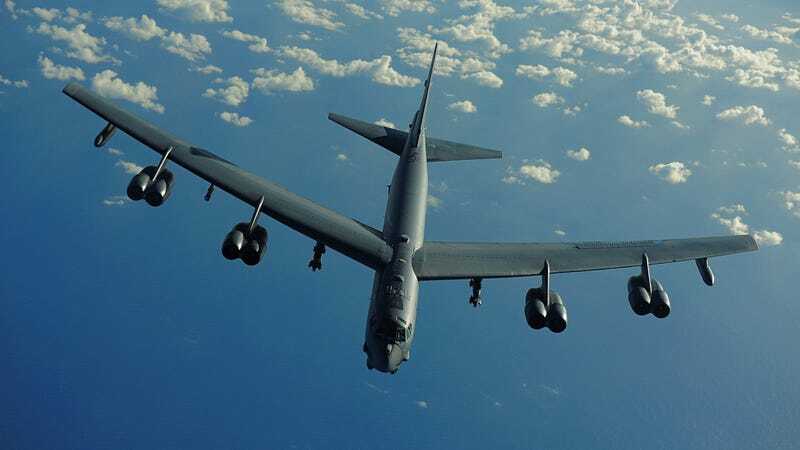 The venerable B-52 may become even more deadly in the future, as Air Force scientists are thinking of ways to arm the bomber with defensive and offensive laser weapons that can incinerate targets in air-to-air and air-to-ground attacks. The age of laser warfare is truly becoming a reality. U.S. Air Force Chief Scientist Greg Zacharias told the defense blog Scout Warrior that under a five-year project called the SHIELD program (that is actually its real name! ), the Air Force envisions creating lasers that can take out a target by putting the laser on the attacking weapon for a long enough period of time. This would come in handy for a large platform, like the B-52, that has to contend with more nimble fighter jets aiming to take it out. Defensive lasers could also jam an attacking missile by sending it off course, as opposed to destroying it altogether, Zacharias said in the interview. The B-52 once had radar-guided machine guns for self-defense, but those were disabled years ago. That mostly has to do with long-range air-to-air missiles coming more lethal, which sort of negated the need for a tail gun. Even with radar fire control, the risk of friendly fire (either from the machine gun itself, or from anti-radar missiles homing in on the tail gun’s radar) was too great. The last gunner to board a B-52 was in 1991, saying costs and cutting 525 positions. That said, the B-52 is not a stealthy platform and needs a modern weapons system that can defend it against smaller, oncoming attack aircraft trying to take it out without risking the lives in gunners who can’t possibly machine gun an AAM out of the sky. The defensive laser weapons could meet that challenge. Another advantage of lasers is their relative low costs compared to using expensive missiles for combat missions. The first airborne tests of lasers are scheduled to take place in 2021. Back in the early 2000s, the Pentagon was experimenting with a system called YAL-1, which was basically a Boeing 747 with a giant laser beam stuck on the front. That was supposed to take out Tactical Ballistic Missiles and Intercontinental Ballistic Missiles from hundreds of miles away, but it was scrapped in 2002. Former Defense Secretary Robert Gates said the system was simply too impractical to work. “There’s nobody in uniform that I know who believes that this is a workable concept, he said in 2009. The POD system, however, seems a lot less ambitious (there’s not talk of it being used to take out ICBMs or TBMs) and scientists appear to have a better handle on the technology. Under the first phase of this upgrade, the Conventional Rotary Launcher will be able to hold 24 GBU-38 500lb JDAMs or a whopping 20 of the GBU-31 2,000lb JDAMs. Laser guided JDAMs and other smart gravity and glide bombs will follow soon after. Yet short-range weapons will not be the CRL’s only claim to combat fame. Soon, the launcher will be able to sling gobs of stand-off weapons such as the stealthy AGM-158 Joint Air-to-Surface Standoff Missile (JASSM) and the very guileful Miniture Air Launched Decoy Jammers (MALD-J). What this means is that a single B-52H could fly thousands of miles around the globe, approach the outer edge of an enemy’s air defenses and let loose a full on barrage of stealth cruise missiles and smart cruise decoys, then turn around to cruise back to base for more weapons and a new crew. Ironically, the B-52, introduced in February of 1955, was supposed to be retired by 1975. But the bomber is expected to be in service until 2040 because no viable alternative seems available. Northrop Grumman won a $21.4 billion contract in 2015 to build the next generation of long-range strike bombers, but those are decades away. Presently, 76 B-52s still make up a majority of the military’s long-range bomber fleet, according to the New York Times. Of course, the B-52 has also gotten its fair share of negative scrutiny because of its lack of agility and age. Just this year, the bomber made news after one of its engines fell off during a flight over an unpopulated area in North Dakota. The platform will be re-engined, in large part because the current ones are not particularly fuel efficient and leaves a black streak in the sky that competes with the Kuznetsov aircraft carrier for being a major environment killer. No matter the grumblings of how old or environmentally unfriendly the platform is, it’s all we’ve got and it is doing a damn good job for a bomber assigned to carry out combat missions during the Cold War era.